Two days ago I was walking to catch my bus and I had to cross the road. It’s a busy road. I was not paying good attention and misjudged the speed of an approaching maniac, sorry, Turkish driver. I had to hurry the last couple of yards to the pavement and relative safety. As the car sped past, inches from my trailing heel, horn blaring, a voice said, ‘Careful, you idiot. You nearly got us all killed.’ In English. Out loud. It was me. And I was addressing myself. I know this because, thankfully, there was no one else around. To be precise, I think it was the DI Romney in me that was addressing the real me, as I was thinking about him at the time. It made me feel a bit weird about myself. It still does. It was a bit of a wakeup call for me about the dangers of becoming too involved with my characters. I’m not sure when I crossed the line or if the advanced level of my condition can be reversed. Clearly, the episode was brought on by a particular event, a near death experience in this instance. But what if the DI Romney in me can be triggered in other ways? What if I’m teaching and one of the kids does something to elicit a reaction from one of the characters who live within me? I could end up swearing at or punching a five year old or a colleague. How could I explain it and remain at liberty? You don’t know them out here. It’s straight-jackets first, ask questions later. But it did make me think that I need to take more care generally. I mean, if I die in a traffic accident, for example, it’s not just me who’s gone. I’d be taking Tom Romney, Joy Marsh, Peter Grimes, Acer Sansom, David Booker and Jo Cash with me, not to mention all the supporting casts from these series. I think I owe it to English literature to use the pedestrian crossings from now on. Just ‘cos I like the cover. 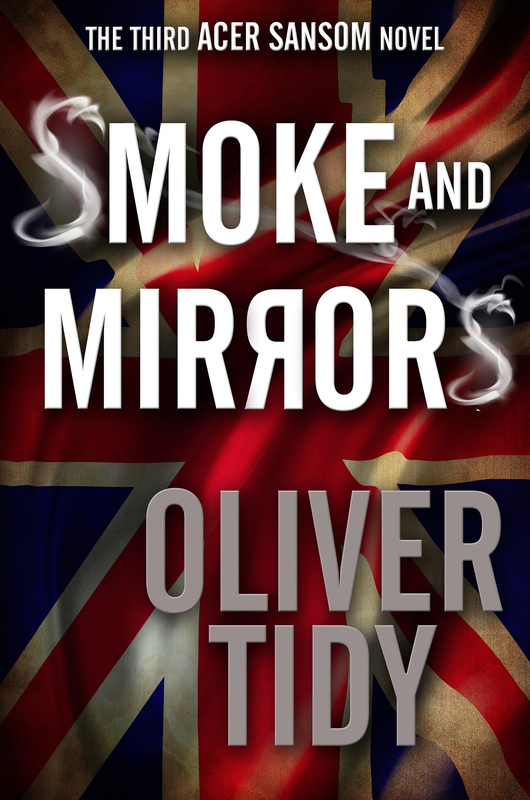 Last week I got Smoke & Mirrors back from the gentleman who proofreads my books. I’ve been reading it through and, as per his advice, the red pen is out again. I’ve been guilty of a lot of waffling, repetition, and the text is littered with clichés and crappy similes. In places it reads like the kind of books I give up on for just those reasons. I’m pretty disappointed with myself. It really needs a good pruning. I don’t mind that as an exercise. In fact I get some satisfaction out of tightening up a text. But I wish I’d made a better job of it before I sent it off. Still, better to find out now than through reader feedback. I also realised from this read through that I have a bad authorial habit of writing something and then finishing the paragraph with a summarising sentence that says it all again, just in case the reader might have missed what I was on about. It ends up as show and tell instead of show not tell. Actually, it’s a cardinal sin for a writer. I should be past all that for crying out loud. Again, I’m doing something about it. Something else to highlight for my writer’s diary this week. I’ve recently finished Booker & Cash #2, so a lot of it is still quite fresh in my mind. While working on Smoke & Mirrors today I recognised a couple of lines that I remembered using in B&C#2. Cue cold sweat. They were quite generic, which makes it more forgivable. Being philosophical about it, I suppose it shouldn’t be such a shock to discover that I have used a line that I liked more than once. (Having spotted them I have changed them.) It made me think about writers who have long running series with their characters. People like Lee Child and his Jack Reacher, for example. He has written nineteen books in this series so far. Has he never repeated himself with a line, a phrase or a bit of dialogue? It’s something else to watch out for and guard against the more books I write. As far as crossing the road and writing goes (not at the same time, obviously), this week has given me some important lessons to learn from. Oliver, please do be very, very careful if you use a pedestrian crossing because the average Turkish driver sees you as a target and will do his very best to score a direct hit! 🙂 Thanks for caring. I will. In my experience Turkish drivers see a red light simply as a rough guide regarding their progress. A golden rule of mine out here is never be the first person on a pedestrian crossing when the green man is lit. Thank you for finding a positive angle for me to focus on. I feel better already because of the company I’m keeping. I wouldn’t worry too much about repeating a line from one book into another. Who would remember? People nowadays are so “forgetful” that in almost every 30 minute TV programme we get told what is going to happen and what has happened, throughout and before and after every single commercial break. Even my wife, who is young and has a PhD doesn’t realise that she asks me three or four times the same simple things like, “Have you put the rubbish out?” etc. etc. I can’t remember, but isn’t that what they call nagging? Ah well, I’m not complaining, she is still talking to me after all. The more I think about it the more ı agree with you – it’s inevitable, I suppose. She who must be dismayed often repeats herself to me, too. But that’s because I never do what she tells me to do any of the first five times. One day I’ll surprise her.